When it comes to designing a bathroom, sanitaryware and even tiling might be the first of your considerations, but bathroom lighting is equally important and requires some careful consideration to ensure you get it right. What's more, creating a good bathroom lighting scheme gives you the chance to add another design element to your room and to conjure up the perfect ambience for restful bathing, as well as serving a functional purpose for those hectic mornings we all know and love (or not). Use our guide to figure out how to choose bathroom lighting that works with your space, while complementing your lifestyle. 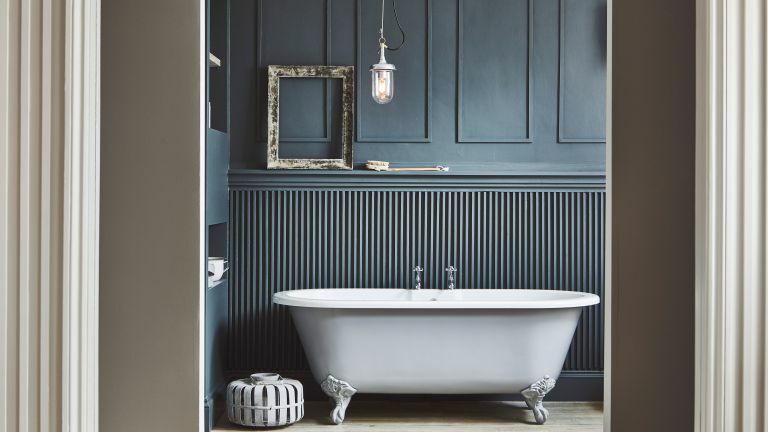 For more practical advice, you might find our guide to how to design a bathroom a handy read. Before investing in any new lighting, think about the times of the day that you use the bathroom; the natural light levels it benefits from; window locations; and whether there are any obstructions to light outside, such as trees. Always consider lighting once the location of fixtures has been finalised – think about the ambience you want to create and the features that you’d like to draw attention to, such as a bath or architectural details. Lay out a floorplan on paper, showing the location and dimensions of sanitaryware, doors and windows, as well as wall, ceiling and floor lights and switches, working closely with your electrician to find practical solutions for your space. No matter the size of your bathroom, multiple light sources will always enhance the design. A combination of downlights, task lighting, accent spotlights and recessed lighting will create a scheme to suit all needs, providing practical lighting for day-to-day tasks, low-level ambient light and illumination at night. Aim to include two circuits on dimmers and one circuit to control a presence detector for automatic night lights. Consider linking your extractor fan to one of the circuits, too. Task lighting to illuminate areas where you need good visibility, such as by the mirror or around the basin. Effectively placed task lighting will prevent eye strain and improve precision when applying makeup or shaving. Mount wall lights at eye level either side of a mirror to avoid shadows. Downlights provide good ambient light with a comfortable level of brightness. Position them around the sides of the room instead of the middle to avoid shadows, and use them to enhance features such as a statement wallpaper or a towel radiator. Don’t fit a downlight directly above a vanity unit or mirror, as this will throw a strong light on to your forehead and cast shadows below the eyes, nose and chin. Consider a chandelier for a high-ceilinged bathroom. Feature lighting highlights design details and creates atmosphere. Using LED strips in niches, under wall-mounted units or bath panels can add interest or draw the eye to a particular area. Night lights that come on automatically via a presence detector when someone enters at night are handy for families with young children or anyone with mobility problems. Try a low-level light to create a floor wash, or an LED strip under a vanity or bath panel – it’ll provide illumination while being sufficiently muted so it won’t wake others in the house. Bathroom lighting must adhere to strict regulations so it is safe to use in a wet environment. A suite is made up of different zones (see more below), depending on the distance to the water source, which determines the type of lighting allowed. Known as an IP (ingress protection) rating, the higher the rating, the more protected the light is. Each zone has a rating, starting from 0, which is closest to a water source, so lighting must be immersion-proof. Outside zones are areas where no water is present. It's sensible for all bathroom lights to be at least IP44, even in outside zones, but always consult your electrician, and check the product descriptions before buying. Look out for lighting specifically designed to be in line with IP ratings. When planning a new suite, whether large or small, the space is broken into zones, each with each own level of safety regulation. Each zone has an IP rating, which determines the level of protection from moisture required and the types of light fittings allowed. All lights used in a bathroom environment, where proximity to water or steam is likely, must have an IP rating. Zone 0 is inside the bath or shower itself. Any fitting used in this zone must be rated at least IP67, which means the fitting is totally immersion proof. Zone 1 covers the area above the bath or shower to a height of 2.25m from the floor. In this zone, a minimum rating of IP45 is required but it is generally accepted that IP65 should be used to ensure safety. Zone 2 covers the area stretching 0.6m outside the perimeter of the bath and to a height of 2.25m from the floor as well as the area around the basin within a 60cm radius of any tap. In this zone an IP rating of at least IP44 is required. Outside zones are anywhere outside of zones 0, 1 and 2 and where no water jet is likely to be used. There are no special IP requirements in this zone, however it's sensi ble that any lights used in a bathroom has an IP rating of at least IP44. While LEDs cost more, the bulbs last for up to 25 years and significantly reduce energy usage. Look out for built-in LEDs in mirrors, bathroom furniture, drawers, sanitaryware and showers available in a range of styles and with touch-screen operation. In a contemporary bathroom, you could introduce colour-changing LED lighting or an LED rainfall showerhead. Looking for more tips on designing your dream bathroom?